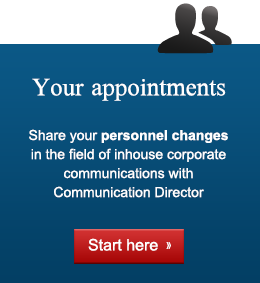 As part of the ongoing evolution in the Group’s organisation, Thales’s Communications Department will change as of April 1st 2013. Matt Pothecar, has been promoted to the position of Corporate Communications Director. He reports directly to the Thales Chairman & CEO and Alexandre Perra, has been promoted to the position of Deputy Director, Group Communications. He remains in charge of Group Media Relations. Pothecary, 41, is a British citizen who joined Thales in 2000 as an International Group Press Officer. He was Communications Director of Thales Raytheon Systems from 2006 to 2008 and Thales Air Systems from 2008 until 2010. Perra, 32, joined Thales in 2008 as an Internal Communications Manager at Thales International. In 2009 he became Corporate Press Officer and was promoted to Head of the Media Relations department in 2011. Perra is a graduate of Institut d’Etudes Politiques in Paris, France and holds a Masters degree in Litterature. Thales is a global technology leader for the Defence & Security and the Aerospace & Transport markets. In 2010, the company generated revenues of €13.1 billion with 68,000 employees in 50 countries. With its 22,500 engineers and researchers, Thales has a unique capability to design, develop and deploy equipment, systems and services that meet the most complex security requirements. Thales has an exceptional international footprint, with operations around the world working with customers as local partners.